Claritas Summer Update Adds Responsive UI, Support for Future ERPs. Monday, July 23 – Empowering the mobility of Project Managers, Executives and the Accounting team, today’s Claritas Summer Update combines a modern, bright and responsive user interface with a flexible architecture ready to connect more services. “Just as our customers do, we aspire to deliver the very best technology and services. The Claritas Summer Update unveils a forward leaning architecture and experience designed to support our users wherever they are – on-site, off-site or on-the-go,” says Jay Ethridge, Founder and CEO of Technology & Business Solutions LLC (TBS). The Claritas Summer Update includes 3 core enhancements, and marks the 35th consecutive quarterly release for the product. Architectural extensibility to support forthcoming options for accounts payable, cash management and general ledgers. The flagship SaaS product from TBS, Claritas aggregates project performance details – including posted, unposted and unprocessed data – from an organization’s hosted QuickBooks or Deltek system into a suite of interactive dashboards and performance modules for project managers, financial managers and business leaders. 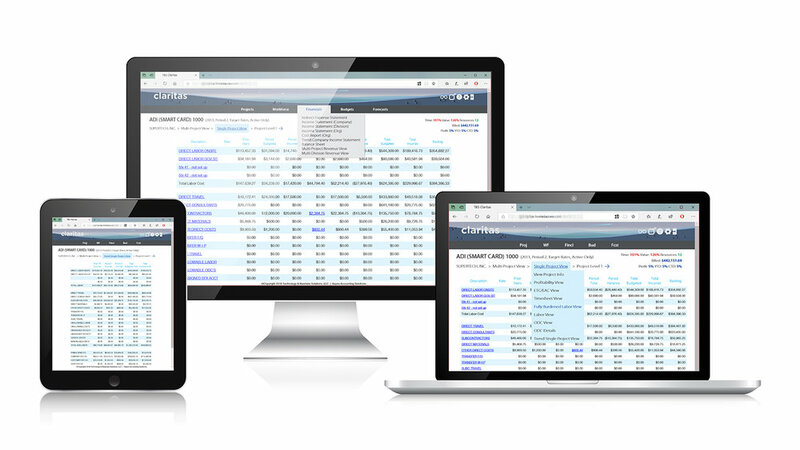 “This is a striking update for Claritas, not just visually but technologically,” says TBS Vice President Eric Brown, an original Deltek founder and co-creator of System 1, the first commercially available accounting software for government contractors. Mr. Brown led the development of Costpoint and GCS while at Deltek for 20+ years. “We're also looking to integrate Claritas with a broad range of accounting functionality in the future,” he adds. Ease of access. The Claritas Summer Update features a bolder and brighter display to enhance readability and streamline report navigation. All Project, Financial and Workforce views pop with bigger text and sharper contrast. Module icons are replaced with clear and direct labels. Menu options are simplified for faster access. Architectural extensibility. Claritas customers are looking for more, so the Claritas framework is updated to connect additional functionality in the future, like accounts payable and document storage. As legacy software vendors continue to overlook the needs of GovCon SMBs, TBS aspires to fill this gap with efficient, easy-to-use GL, Cash, AP and AR options. For your personal tour of the Claritas Summer Update, contact TBS. Current Claritas customers should email Support@TBS-llc.com. Potential Claritas customers Claritas@TBS-llc.com. Claritas is the flagship SaaS product from TBS, aggregating project performance details – including posted, unposted and unprocessed data — from an organization’s hosted QuickBooks or Deltek system into a suite of interactive dashboards and performance modules for project managers, financial managers and business leaders. In addition to 85 other performance views, Claritas includes daily Project Summary reports, Labor Utilization analysis, and a live Statement of Indirects, as well as easy-to-use Project Budgeting and Forecasting. Claritas adds user-friendly Project & Workforce Forecasting Features with Q1 Update.